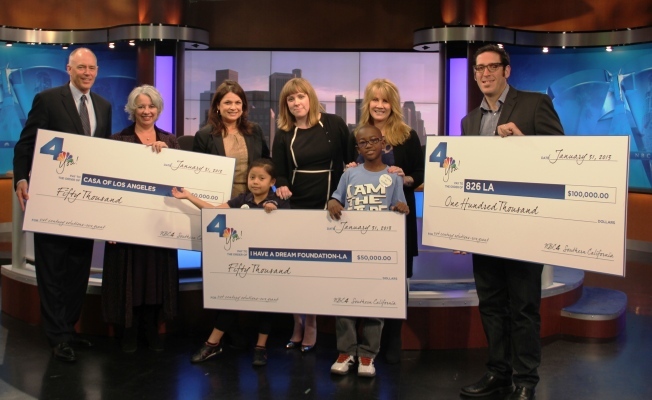 NBC4 Southern California recognized the recipients of its first annual 21st Century Solutions grant challenge at a check presentation hosted at the station on January 31. After an extensive application process, NBC4 awarded grants of $100,000 to “826 LA,” $50,000 to “CASA -Los Angeles,” and $50,000 to the “I Have a Dream Foundation-Los Angeles,” for a total of $200,000 in donations. NBC4 is among the 10 NBC owned and operated local stations that partnered with the NBCUniversal Foundation to launch the annual 21st Century Solutions campaign, which provided a total of $1.2 million in grants to nonprofit organizations across the 10 communities served by the NBC owned stations. The funding will come from the NBCU Foundation. 826LA is a non-profit organization dedicated to supporting disadvantaged students with their creative and expository writing skills. NBC4’s $100,000 grant will be used to fund 826LA’s College Access Programs, including its “Great L.A. Personal Statement Day.” This program is the only project of its kind in Los Angeles that provides comprehensive workshops and free individual writing support during the college application process. Through these programs 826LA reduces obstacles stopping thousands of students from receiving the help they need to apply and be admitted to college. CASA of Los Angeles (Court Appointed Special Advocates) improves the lives of children in the dependency court system through trained, dedicated and effective volunteer advocates who are supported by experienced staff. NBC4’s $50,000 grant will support CASA’s Early Childhood Initiative (ECI) curriculum. Through the ECI, CASA aims to support earlier intervention services for the youngest children entering the dependency system, thereby reducing the number of children who remain in long-term foster care. I Have a Dream Foundation – Los Angeles (IHAD-LA) strives to help children from low- income areas become productive citizens by providing a long-term program of mentoring, tutoring, enrichment with an assured opportunity for higher education. NBC4’s $50,000 grant will be used to fund IHAD-LA’s “New Class of Dreamers” in Watts. This project will sponsor 70 third grade students, from one of LAUSD’s lowest performing schools, and will provide a comprehensive program geared towards their academic, cultural and emotional enhancement. This project is unique in that IHAD-LA will support this same group of students for more than a decade to maximize their chances of success through higher education.